Apr 29 – St Peter of Verona, OP, (1206-1252), Martyr – Credo in unum Deum | ADULT CATECHESIS & CHRISTIAN RELIGIOUS LITERACY IN THE ROMAN CATHOLIC TRADITION: hosting ONLY True Christians!! !, or "How to think Catholic!!" I am always, at least a little, scandalized when during Mass, very casually, very nonchalantly, an alternative, “hip”, creed or profession of faith is substituted, is injected as if it were no big deal, even with the best intentions. I am regularly interrogated by my more orthodox friends where this happens, they are so scandalized, but I don’t name names. This truly, really shows the ignorance, at best, of those planning and leading the liturgy. Besides being against Church law, and they know better, people have died in wars over one tittle, one, literally, iota, in a word of the Apostles’ Creed. Every iota, too, is literally packed with meaning, reason, and history. Take away the iota and, at least in Greek, you change the entire meaning, dramatically – and east cleaves from west, literally, creating schism. One word becomes another in Greek, with an entirely different meaning. With all our “diversity and relativism”, it is hard to imagine riots in the streets of Alexandria in Egypt over such things, but common they were. Growing up Catholic, repetition causes “conditioned response” – occupational hazard. It’s one of the ways you can tell if someone is Catholic without directly asking them…”The angel of the Lord…and she conceived…”, I suppose even self-proclaimed Catholics might miss that one today, too, tragically. (As my Latin teacher ALWAYS proclaims, “It’s ALWAYS better in Latin!”) So much conditioned response, we neglect to really unpack each of those words, each iota, and ask, “Why is that there? Where did it come from? Why is it sooooooo important?” And, there ARE reasons! REALLY good ones! So, to chuck the whole thing with, “we’re bored”, or self-anointing – SOMEHOW in 2012, we finally just had the Holy Spirit impart to US what to do?, or just plain ignorance, does take my breath away. When they make these too, too casual substitutions, I pray to St Watermelon. Let me explain. My dear friend, Julia, who went through RCIA at Old St Pat’s taught me about St Watermelon. Let me explain. Not being able to remember all the prayers, Julia knew that the word “watermelon” forms all the lip movements and mouth movements and gestures, according to Julia, one would be expected to show if actually speaking intelligible words in front of others. Since Julia could not remember all the prayers, she moved her mouth saying, quietly, “watermelon” over and over, try it sometime when you need to look like you’re participating but don’t know how or don’t want to. So, when random, strange sequences, no matter how beautiful or well intentioned to some beholders, are offered, I either say the word “watermelon”, or remain silent, the “silent Irish” is my most favorite new expression, to expressly demonstrate, in my heart and to God, my disunity with what is being offered at that time, in what is supposed to be a prayer of unity. You’ll see what I mean below. “St Watermelon”, were you real, pray for us! P.S. And the new translation of the Mass? Pee-yoo! I am not a fan. The Four Liturgists of the Apocalypse. It’s just bad English. Exactly what we don’t need now, or ever. Silly. Stupid. I haven’t responded at Mass since November. So much for “full & active participation”. The words won’t come out. Not those words. I will be the “silent Irish” for the rest of my life at Mass, assuming continued attendance. Forty-six years and you really start to think, maybe I need a break. Maybe I need something new? A religion with a hierarchy primarily necessitates faith, hope, and love as a requirement. I’m tired. Jesus, and the ghosts of my parents, prod me. I keep going. Such a magnificent Church with such a magnificent patrimony; truly the People of God, and leadership which makes my eyes cross. They’re just as human as atheists, I realize. Just like the Keystone Apostles who are one minute in Scripture swearing to die to defend Jesus, and the next…crickets chirping. All have taken a powder. Peter going as far as “Oh, Hell no!” There are too many saint stories where they had to put up with the all too human nature and shortcomings of their leaders/superiors. “I came to serve, not to be served.” The washing of the feet – humility is the most important virtue of the Christian cleric. How true. I just need something a little more inspiring if I am going to believe. The hierarchy make me wonder often if they’ve ever actually read the Gospels. They give me a headache. Only the Keystone Apostles give me hope, in this regard…and my saint friends. They sustain me. To have faith is to have doubts. Otherwise, it wouldn’t be faith, would it? To have faith is to struggle. How does the old joke go? If you want to lose your faith, go to work for the Church? -The Death of Saint Peter Martyr, OP, attributed to Bernardino da Asola (1490-1535), oil on canvas, height: 101.5 cm (40 in). width: 144.8 cm (57 in), National Gallery, Central Hall – Northern Italy 1500-1580, Trafalgar Square in the City of Westminster, in Central London. -The following article was written by Fr. Darren Pierre, O.P., Promoter for the Lay and Priestly Fraternities of St. Dominic, Province of St. Joseph. “I heard a story about a young boy named Peter whose parents were fallen away Catholics. Peter’s parents had traded their Catholic faith for fad beliefs that were more convenient and fit in better with their family and friends. Catharism, or Cathars, Albigensians, Manicheaism, etc., held all material reality was created by an evil god, and all spiritual reality, which was the work of a good god – Dualism. Heresy, untruth in light of the orthodox, universal Christian faith handed on by the Apostles. However, like many fallen away Catholics, they didn’t take their new beliefs very seriously either. In fact, they reasoned that all these little details really didn’t matter—one religion was just as good as another. Because they felt this way, they decided to send Peter to a Catholic school as it was regarded as the best school in the area, even though they didn’t follow the Catholic faith anymore. However, Peter’s uncle, who had also left the Catholic faith, took his rejection of the Faith much more seriously. One day he asked Peter what he was learning in school, and Peter responding by reciting the Apostle’s Creed. Peter’s uncle was outraged and didn’t want his nephew learning any of this Catholic nonsense. He tried to convince Peter’s parents to take him out of that school. Yet, despite his protests, Peter’s parents didn’t see it as a big deal. To them it was an unimportant argument about words—prayers that children memorized. In the end they figured it was all the same and didn’t really matter, so they let Peter stay in that school. Every means was used to persuade Peter, and even to oblige him to say, that all material things are the work of the devil, or the evil principle. “No,” replied the youthful disciple of Christ; “there is but one first principle, the supreme God, omnipotent, and the sole Creator of heaven and earth – Credo in unum Deum. Whoever does not believe this truth can not be saved.” The heretical uncle, confused by his defeat, and foreseeing what might come to pass, spoke sharply to his brother, and told him that the best thing he could do would be to take the boy out of the hands of Catholics as soon as possible. “For,” he added, “I fear lest, when he becomes older and better instructed, he may destroy our religion, should he pass over to the prostitute” -– the name by which he designated the Catholic Church. Peter’s Uncle was correct about one important thing: words do matter. The words of the Creed have always been precious to us Christians. The early Christians called them the Symbol of Faith. It was a symbol or mark that outwardly showed what was invisibly believed. Of course, the ultimate object of our faith is God Himself. Our faith is in the Word, not in mere words no matter how true or precious that might be. Yet, the words do matter. The words of the Creed are called secondary objects of faith because they connect us with God, the primary object of faith, Whom we cannot see. If the details of the secondary objects are wrong, we are not able to be as connected to God. Ultimately, if our secondary objects are wrong enough they will connect us not with God, Who created us and loves us, but with an imaginary god that is not real and loves us no more than an ancient pagan idol. The precise details of the creeds have led countless Christians to God, including the young boy named Peter whom I mentioned in the beginning. Although Peter’s story sounds very modern, it actually took place back in the 1200’s in the city of Verona in what is modern day Italy. The truths of the Faith that Peter learned in the Apostles’ Creed became so important to him that he became a Dominican in order to preach that truth. He was received into the Order of Friars Preachers by St. Dominic himself in those very first days of the Order. He spent the rest of his life preaching about the truth of God to people who had fallen away from Faith like his own family and guiding many of them back to the Church. He was so successful that the leaders of those who opposed him conspired to assassinate him. On April 6th, 1252, they ambushed Peter and a traveling companion on a lonely road outside of Milan. The assassins grievously wounded Peter’s traveling companion and struck Peter on the head with an axe-like implement. As he was being attacked, Peter began to recite the Creed, the Symbol of Faith for which he would give his life. Born in the city of Verona into a family perhaps sympathetic to the Cathar heresy. 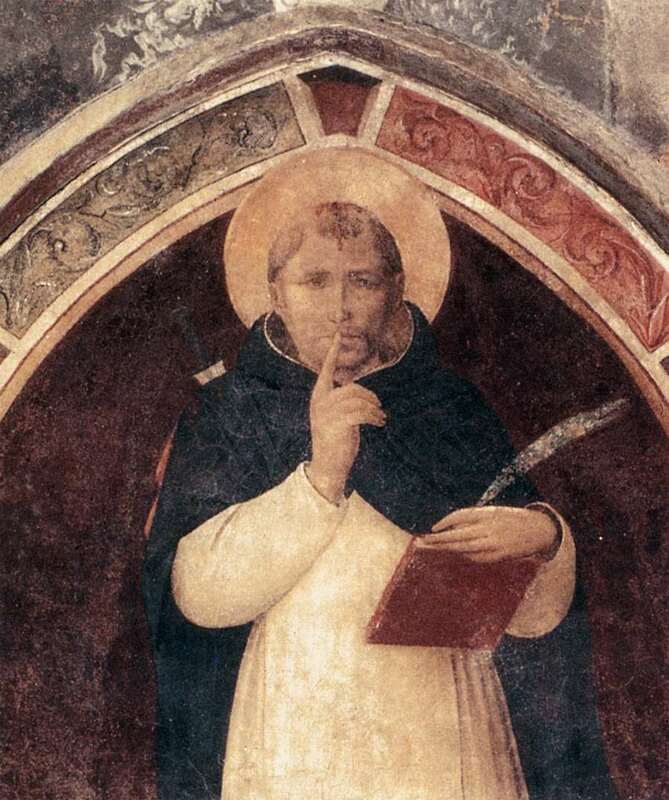 Peter went to a Catholic school, and later to the University of Bologna, where he is said to have maintained his orthodoxy and at the age of fifteen, met Saint Dominic. Peter joined the Order of the Friars Preachers (Dominicans) and became a celebrated preacher throughout northern and central Italy. From the 1230s on, Peter preached against heresy, and especially Catharism, which had many adherents in thirteenth-century Northern Italy. Catharism was a form of dualism, also called Manichaeism, and rejected the authority of the Pope and many Christian teachings. Pope Gregory IX appointed him General Inquisitor for northern Italy in 1234. and Peter evangelized nearly the whole of Italy, preaching in Rome, Florence, Bologna, Genoa, and Como. In 1251, Pope Innocent IV recognized Peter’s virtues, and appointed him Inquisitor in Lombardy. He spent about six months in that office and it is unclear whether he was ever involved in any trials. His one recorded act was a declaration of clemency for those confessing heresy or sympathy to heresy. In his sermons he denounced heresy and also those Catholics who professed the Faith by words, but acted contrary to it in deeds. Crowds came to meet him and followed him; conversions were numerous, including many Cathars who returned to orthodoxy. Because of this, a group of Milanese Cathars conspired to kill him. They hired an assassin, one Carino of Balsamo. Carino’s accomplice was Manfredo Clitoro of Giussano. 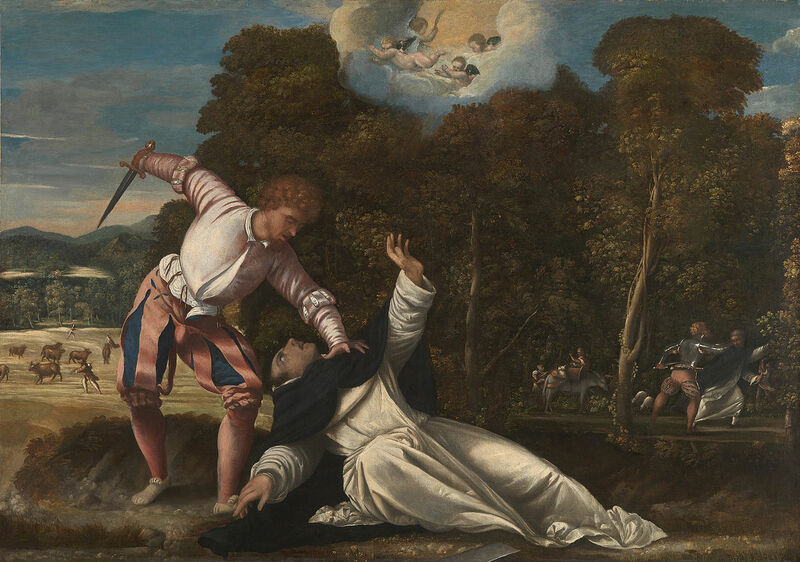 On April 6, 1252, when Peter was returning from Como to Milan, the two assassins followed Peter to a lonely spot near Barlassina, and there killed him and mortally wounded his companion, a fellow friar named Dominic. Carino struck Peter’s head with an axe and then attacked Domenico. Peter rose to his knees, and recited the first article of the Symbol of the Apostles (the Apostle’s Creed). Offering his blood as a sacrifice to God, he dipped his fingers in it and wrote on the ground: “Credo in Unum Deum”. The blow that killed him cut off the top of his head, but the testimony given at the inquest into his death confirms that he began reciting the Creed when he was attacked. Carino, the assassin, later repented and confessed his crime. He converted to orthodoxy and eventually became a lay brother in the Dominican convent of Forlì. He is the subject of a local cult as Blessed Carino of Balsamo. 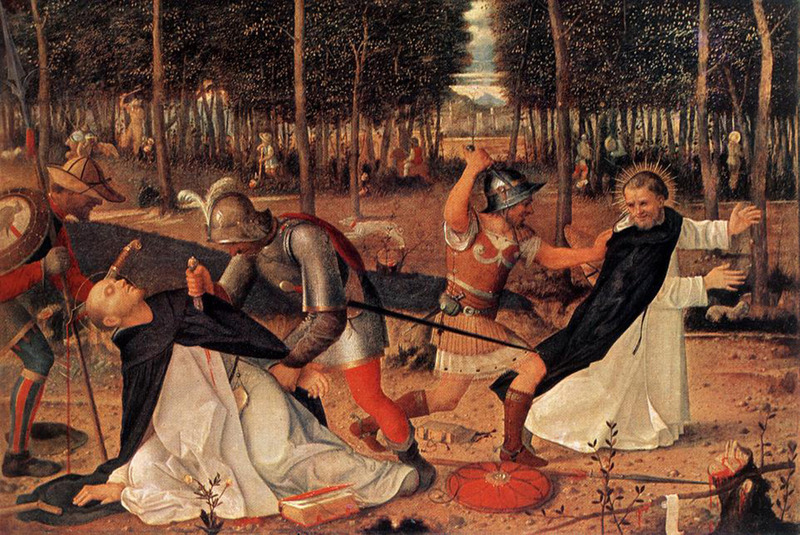 -Assassination of St Peter Martyr, O.P., Bellini, 1509, oil on panel, 67.3 x 100.4 cm, Courtald Institute, London, on the left St Peter the Martyr is represented as being murdered by Pietro da Balsamo, a heretic. 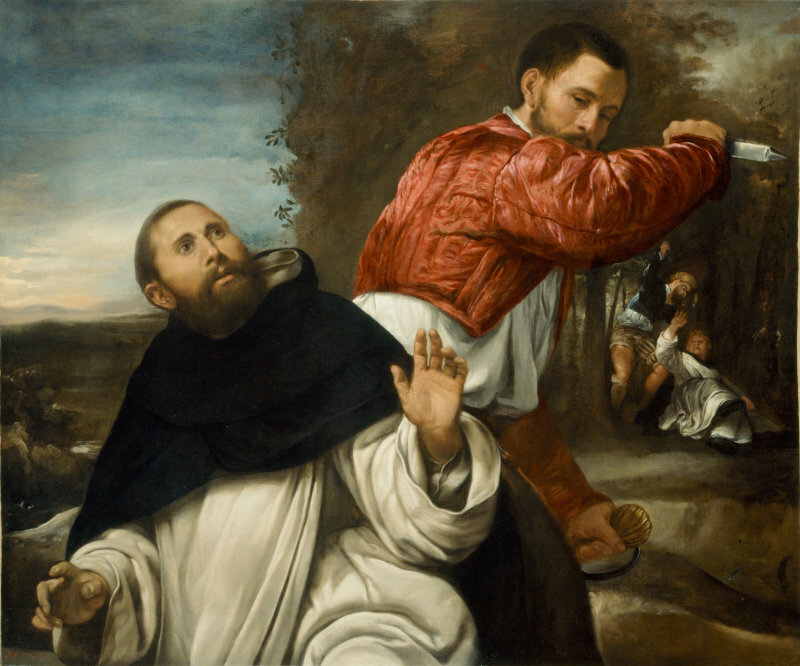 On the right another monk, Fra Domenico, tries in vain to escape. Knows well the path to God.